Today is Black Friday. The day American businesses hope to get out of the red and into the black. I’ve always though they could have picked a happier and less obscure name for the day. Like perhaps, “Total Consumerism Day” or maybe “Make Santa Happy Day” or “Buy My Stuff Day.” How do rural communities and the elderly fare on this day of shopping frenzy? In smaller rural communities so many economic functions have been lost that alternatives and variety in shopping are very limited and shoppers need to travel to larger communities to shop. Also, congestion on both the roads and at stores is mentioned by elders as a concern when going shopping. For elders with transportation limitations there are programs offered under the Older Americans Act that provide rides for essential trips, such as medical appointments, business errands, shopping and senior activities, with door-to-door transportation often available (http://www.raconline.org/info_guides/aging/agingfaq.php). Finally, many elders cite going shopping as a social activity and find interactions with friends they run into and store personnel to be pleasant activities (Curch & Thomas). So, while rural communities often are not a shoppers paradise; going shopping can be done by older individuals. Not many older people go shopping on Black Friday. 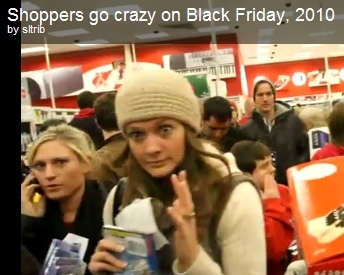 A recent survey indicated that 10.5% of shoppers 65 and older will participate in Black Friday weekend shopping (Consumer Intentions & Actions® Survey, November 11, 2011, National Retail Federation, http://www.nrf.com/modules.php?name=News&op=viewlive&sp_id=1251). Considering the benefits and limitations of “Going Christmas Shopping” to what degree are older persons sidestepping the whole issue and shopping on-line instead? In general, online shopping has been growing and it’s pretty obvious that for those of us at the end of a rural delivery route that getting stuff by mail or FedEx is a whole lot easier than driving 40 miles to the nearest major mall. Even Christmas has it’s online alternative to Black Friday. It’s called Cyber Monday and it is growing as an option to fighting the crowds. “ComScore, a digital marketplace research firm, expects online sales for the 2010 holiday season will reach $32.4 billion, marking an 11% increase over the previous year for the combined November-December gift-buying period” (http://money.cnn.com/2010/11/26/news/economy/cyber_monday_next/index.htm). So on-line use has been growing and what is the impact on the elderly? According to a survey by Jones and Fox, “the biggest increase in Internet use since 2005 can be seen in the 70-75 year-old age group. While just over one-fourth (26%) of 70-75 year olds were online in 2005, 45% of that age group is currently online.” Jones and Fox do not discuss online shopping and I could not find specific figures for either elderly or rural populations. In conclusion, the data are incomplete on my question of the degree of geriatric online Christmas shopping. I’ll have to look into it more, but as it’s Black Friday and the day is slipping away, I need to get a few more things online.